This spotlight article is from Benjamin Meinen, one of the ECCE student associates at UW. He is a graduate of the Honours Geography and Environmental management undergraduate program at UW, and will be continuing his studies as a Masters student in Geography. Below he describes some of his work on a recent project for modelling agricultural erosion for the Grand River Conservation Authority. I just completed my Honours Geography and Environmental Management program at the University of Waterloo and received my Bachelor of Environmental Studies. During my last year as an undergraduate I took a strong interest in conservation efforts on agricultural lands. During a fourth year course taught by Dr. Derek Robinson, I worked alongside with Jack Su, Omar Dzinic, and Caroline Kayko on a project for the Grand River Conservation Authority (GRCA). 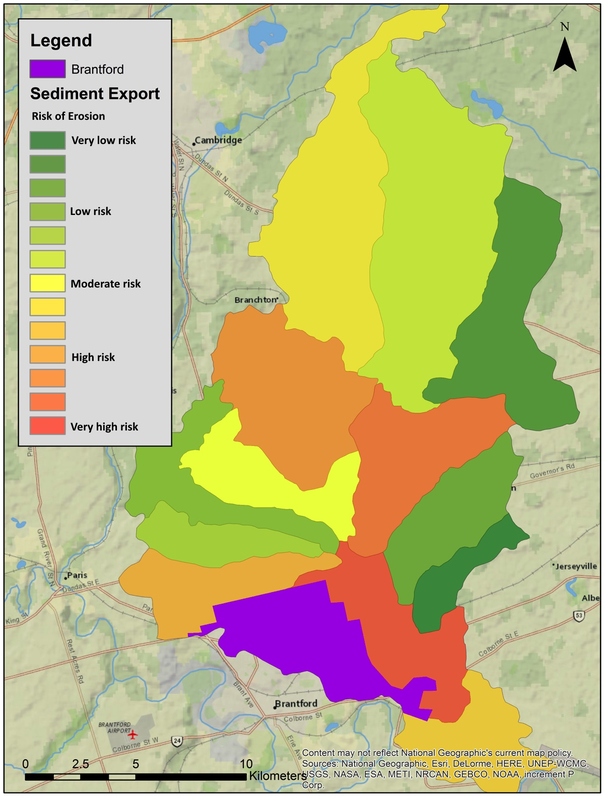 We worked with the Revised Universal Soil Loss Equation (RUSLE) and ArcGIS to quantify soil losses in part of the Grand River Watershed. I continued my work on soil erosion modelling for the GRCA in another sub watershed. I explored the applicability of RUSLE, stream power, and empirical and process-oriented models, for their ability to quantify erosional rates on agricultural fields and erosional rates in-stream. The results that lined up best with historical sediment data was the RUSLE with a sediment delivery ratio for overland erosion, and the Generalized Watershed Loading Function (GWLF) for in-stream erosion. Both these models are simple empirical models but they can perform very well at assessing erosion at a sub basin scale. The end result of this project showed the most erosive sub basins that needed to be targeted with conservation efforts. 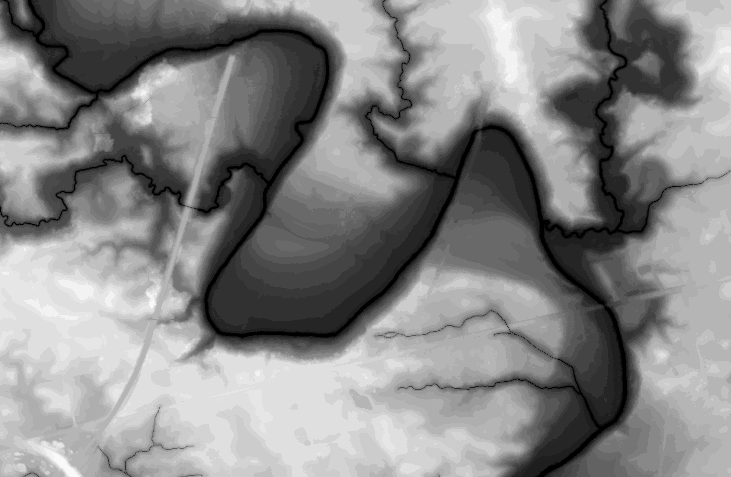 The study area for my second project with the GRCA looked at Fairchild Creek, which has the most erosive basin in the Grand River Watershed. 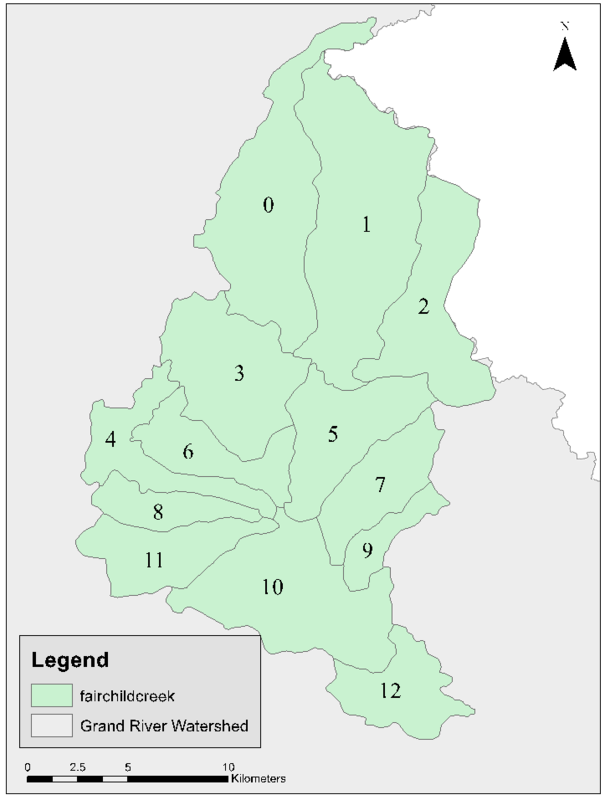 The final product for Fairchild Creek, showing the areas in the watershed that needed to be targeted for conservation efforts. A further breakdown was done, dividing the watersheds into 225 sub basins to locate the exact fields and locations where erosional rates were classified as severe. Exact quantities exported were calculated for each sub basin. 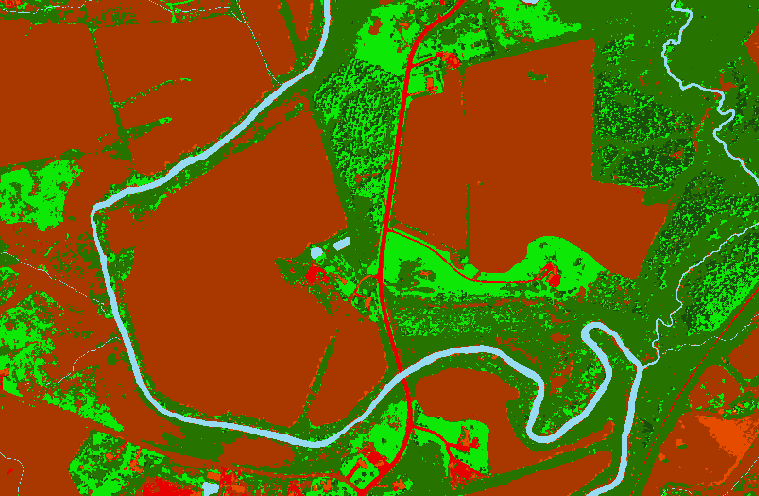 This land cover data was developed with the help of Alex Smith using the SWOOP 2015 imagery for use with the project. A maximum likelihood classifier was used to generate land covers at an extremely high spatial resolution of 20cm. A new technique was examined using a breach depressions algorithm and a hydrological breach burn to condition the elevation model with the least amount of artificial change. This method gave excellent results generating flow lines both in-stream and across fields that matched real world data. This method was developed by John Lindsay at the University of Guelph. I have continued my work in soil erosion studies and started my MSc in Geography at the University of Waterloo with Dr. Derek Robinson as my supervisor. I am studying the applicability of a diachronic analysis of agricultural erosion using photogrammetry. We are developing a methodology for using extremely high resolution imagery from a UAV (~1cm pixel size) to look at how rills develop and progress over time, and quantifying exact erosional rates on fields. This bypasses the need for empirically based models (e.g. RUSLE) or complex physically based models (e.g. WEPP) that do not deliver satisfactory results at a field level. Small scale erosion is heavily influenced by the micro topography of the field, its edaphic characteristics, surface texture and compaction, and many factors that are extremely difficult to model. A UAV-based method looks to circumvent the need for complex models. All calculations and DEM processing are being performed with Pix4D as well as ArcGIS.